Here's a heavily color-corrected photo of Amy's digits and their new adornment. Our first attempt at macro photography (the better to show off the ring's three-dimensionality) was unsatisfying to say the least, so we'll attempt a better photo soon. There has been much showing-around of the item, not to mention well-wishing and congratulations from all and sundry, though Amy and I wound up using this past weekend more for respite from proposal excitement than for an exhibition tour. This weekend will be different! Amy has a great deal of family and not a few friends in the Birmingham metropolitan area, and few of them outside of her parents and coworkers have yet seen the Bling, so remedying that has taken on new importance. For our part, Amy and I are very much enjoying visiting old haunts with the new Bauble, and the happy delirium has yet to subside. Plans for the Event (still looking to arrive in late April or early May '07) proceed apace, but as yet there's still an awful lot in flux. Exciting! I'm over the moon, everyone. This has been a bit of a trying week at work, but knowing that my fiancée is out there and eager to see me imbues each day with that right sort of purpose, relegating the rough spots in life to simple background noise. The deed is done, the Bauble presented, the question popped and answered in the affirmative. 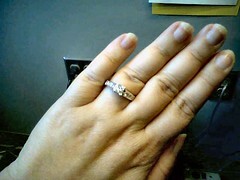 Amy and I are engaged! I wish I could have chronicled the particular ins and outs of the shopping for the Bauble, the customization of the Bauble, the merry paper chase that was paying for the Bauble after my identity-theft troubles last year (jewelry isn't exactly a purchase for slipping past the pattern-recognition algorithms they use to catch ID thieves), but none of those particularly matter now: I have a fiancée! I had a plan of my own all lined up (with props, patter and everything! ), but circumstances, schedules and other factors kept me from being able to implement it. In any event, Amy and I wound up heading to a favorite Persian restaurant of ours last night to watch a bellydancing friend of hers perform. I managed to get the friend to give me a cue, and proposed to Amy in front of the entire restaurant, to great applause and appreciation. We're both deliriously happy, and by all accounts Amy is having a grand time exhibiting the Bauble to all with eyes to see. We also have a birthday party to attend tonight, and I have to imagine that her shoulder muscles will receive further exercise there. A photo of the Won Hand and its Bauble is forthcoming, once taken.